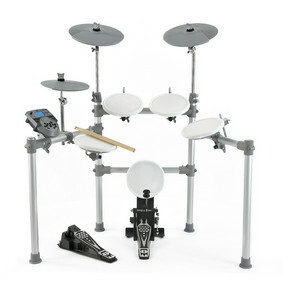 In my search for a fun present for Shelley I have been looking at Electronic Drums. This appears to be manufactured by http://www.medeli.com.hk and branded by several suppliers. The models in the range are the DD501, DD502 and DD505 and the above DD516. Others brands for the same items are, Session Pro, Techtonic, Technote and Medeli. The various brands of the same kit are all available on ebay. Edit: Shelley liked them so much we have added better quality individual drums to her set. She likes the Roland drums.